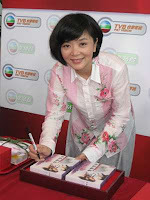 Idy Chan was interviewed by TVB paid TV programme, BE MY GUEST , (Zhi Yun Dining Time ) , yesterday. Manager Chen Zhi Yun presented her with a basket of foods, countdown timer funnel, & a calligraphy by Andy , Shan Xin Lian Lian ( being kind-hearted continuously) . Idy was delighted on seeing Andy�s calligraphy. Idy Chan was recorded for the TV programme Be my Guest yesterday. The host Stephen Chan gave her some gifts: a timer funnel (encourage everyone to use some time to do good deeds), a basket of food (for Idy pleasure since she doesn�t lack any materials thing) and a very special one was just sent out from Taiwan. 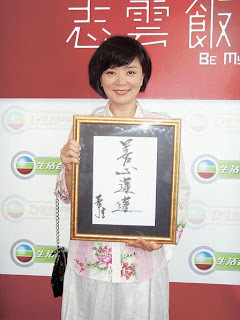 It is a calligraphy 「善心蓮蓮」 (it means a kindhearted Idy) written by Andy Lau. It surprised Idy very much and in return, Stephen asked Idy to sign on the ROCH DVD to give to Andy. He also invited Idy come back filming so that she could collaborate with Andy on screen again. Idy: I need to contemplate it when I go home. Just don�t want the praise go to my head and blind me. 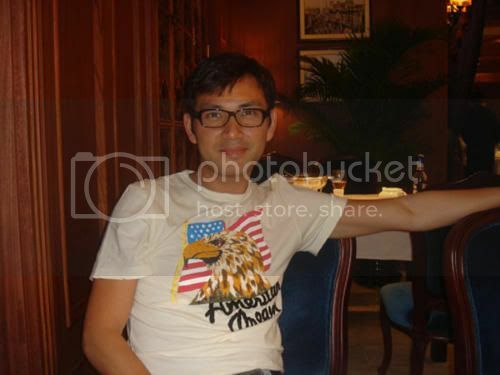 Stephen Chan also gave Idy a polo T-shirt and 2 books, as he wanted to invite Idy filming On the Road season 3 but she didn't agree. Reporter: Speaking about the interview in Be my Guest, are there any questions you won't answer? Idy: It depends on how to respond. I'd rather zip my lips than to give out a vague answer and confuse the audience. Thanks to Andy Town for the first translation and Kit from Idy Forum for the interview translation! Kenix visited Toronto for vacation with husband Frankie. even though the weather was very cold with the freezing rain, Kenix and Frankie still went outside to take pictures to share with fans. I've been in Shanghai for more than a week to film my new series. today, the filming wrapped up at 5pm and i went to eat dinner with my colleague Laura. after i got back to the hotel, i wanted to share my feelings with you all. the weather in Shanghai is very hot and humid right now, but i'm having fun because the crew treat me very nice. also, there are many fans who come to visit me. thank you very much! Okay, i have to go read my script to prepare for my scenes tomorrow. i will show you the filming pictures some other day.